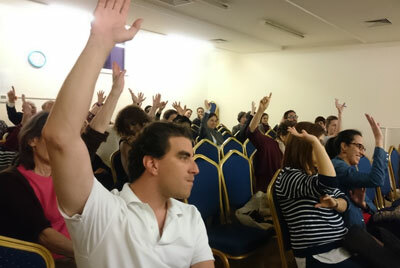 On Saturday 18 June, the French living in London gathered at the Ecole Internationale Franco-Anglaise to discuss the “plan école” and their concerns about a possible Brexit. The senators representing the French living abroad, Olivier Cadic and Joëlle Garriaud-Maylam, as well as UFE (Union des Français de l’Etranger) members, were present to listen to people and answer their questions. With about 350,000 French living today in the UK, more and more French and bilingual schools have had to be opened to ensure that French children can follow a French school curriculum. The “plan école” has been created to ensure that every child can ultimately have access to a French school. The initial objective of this movement is that all the statistics about French pupils in London should be submitted to a central database to facilitate planning. For years, the UFE has been asking for new classes to be opened or new schools to be created to allow 2,000 new pupils to enter the French school system in London. Thanks to the creation of the Collège Français Bilingue de Londres (CFBL) and the Lycée international Winston Churchill, this goal has now been reached. 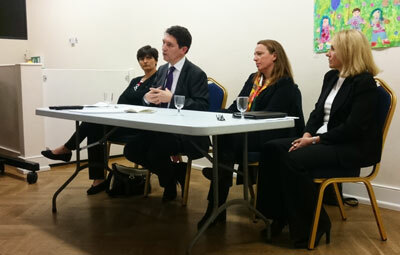 The Senator Olivier Cadic, UFE President Carole Rogers and the Consular Adviser Sophie Routier met French parents to keep them informed about the current situation and listen to other issues that might be addressed. Even if many pupils now have their place in a French school, parents face other problems. Joëlle Garriaud-Maylam, also Senator for French living abroad, was in the audience. The place pupils are sent to when they finish primary school was the main issue raised during the meeting. Some French families have had to move house because their children have been sent to the Winston Churchill school. Pupils are being asked to travel up to one and a half hours every morning to get to school. Some primary schools also suffer from this situation, as people tend not to register their children in classes too far from the French lycées. Some parents do not understand how the administrative commission decides to allocate their children to one school or another. Pupils who should go to the Lycée Français Charles de Gaulle are told to go to Winston Churchill instead. In response, the UFE has been requesting that parents and elected officials attend the Commission meetings as observers. The aim is to make sure children are allocated to a place that corresponds to their schooling requirements and geographic area. This request has been refused for the last two years. Patricia Connell, elected representative of the French living abroad, then spoke about the EU referendum and a potential Brexit. Most of the French people living in the UK, if not all of them, are concerned about such a possibility. 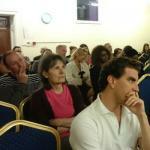 The audience members shared their recent experience. One woman had been insulted in the street for being French while others had been asked how long they had been in the UK. Since the referendum debate has been going on, British citizens in favour of Brexit seem to be showing more and more distrust and dislike of foreigners. What should the French in the UK do if the UK leaves the EU? Would they be asked to leave the country? Should they apply for British citizenship? Many issues were raised as people feel increasingly worried about the implications of a possible Brexit. Most of the people attending the meeting had lived in London for five years or longer and so did not see themselves going back to France after all this time. Applying for British citizenship is a long and expensive process (£1236). Applicants have to prove that they have lived in the country for more than six months a year and then also take a knowledge test which is said to be quite difficult. They are also have to prove that they have lived for a minimum of 5 years in the UK. This is what Patricia Connell highlighted: people can ask for a Certificate of Residence as soon as they move to the UK. This should make the difference between them and other expats coming after the 23 June EU referendum. The consequences of a Brexit are still unknown, as negotiations have not started between the British government and the European Union. But even if they could be negative for the French community in the UK, it is important to say that changes will take years rather than months. So do not panic, there will be solutions other than going back to France.